Launched in 2002 to commemorate ten years of the Siglo series, the Siglo VI is rich in complex flavors and is considered today, as one of Cuba's finest cigars. Stunning to the eye, with a large ring diameter of 52 and oily golden Colorado wrapper, this cigar delivers creamy notes of leather, cocoa and sweet spice. 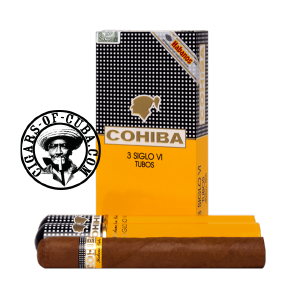 The large size of the cigars allows you to savor the aromas in the initial phase in a warm and gentle smoke. The power of the beast appears in the second phase before building to a strong climax in the finish. An indispensable must for any aficionado. Like it's name suggests, Cañonazo, its a Canon of a cigar! Splendid development of aroma with the huge diameter and naturally, all the power one would expect from a cigar of this size. Cohiba flavors to the max. Hard to let go its so good!